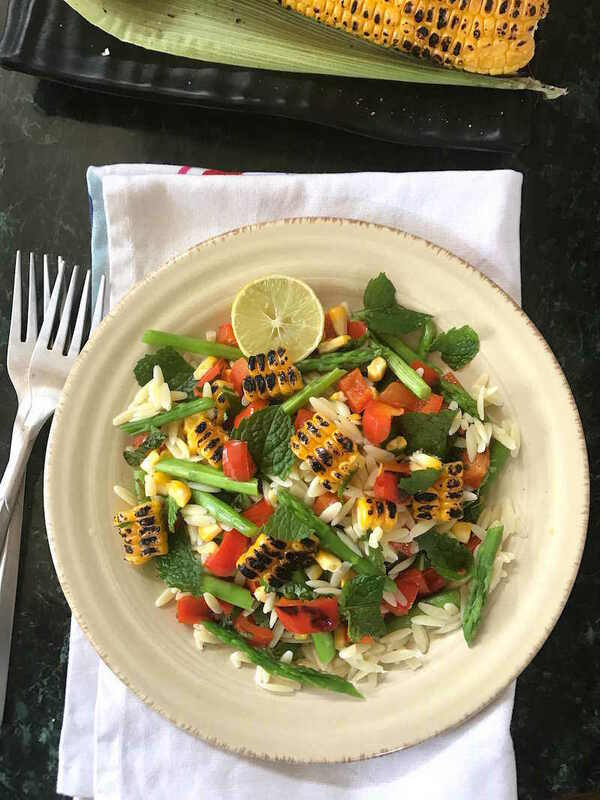 This grilled corn salad with orzo pasta and asparagus is a colourful healthy addition to a summertime menu. 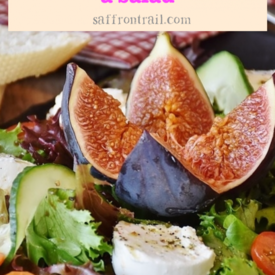 Read my post and get this easy recipe for a delicious salad. It’s always fun biting into a well grilled corn on the cob – the sweet juiciness inside the kernels being offset the smokey bitterness in the charred bits. A generous coat of salt rubbed using a lemon half imparts that salty citrus hit that makes the tastebuds sing. So there’s no denying that a grilled corn on the cob is a gustatory delight on its own. The first one is a grilled corn salad with orzo pasta, seasonal asparagus and some sautéed red bell pepper for colour contrast. The second one, you’ll have to wait for my next post. If you haven’t yet signed up to my newsletter which will automatically send you my new post alert in your mail box, this is the time to sign up in the newsletter box in the side bar! Let’s get back to the salad talk, shall we? Here’s my little secret…whenever I’m putting together a salad, it’s either a coming together of everything in my fridge or a well planned situation. When it’s the latter, I actually imagine a colour wheel in front of me to get inspiration for contrasting colours I can add to my main ingredient, in this case the grilled corn. So I decided that I wanted to add green and red colours to the yellow corn to make this as pretty as a picture (which is automatically Instagram friendly too – double win!). 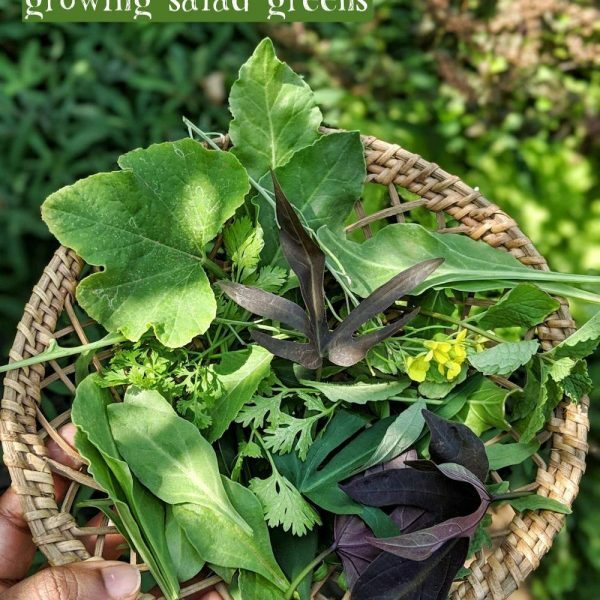 Adding a variety of colours to your salad ensures a variety of phytonutrients which is just a fancy term for nutrients derived from plant sources. Let’s jump straight into the recipe, shall we? This grilled corn salad with orzo pasta and asparagus is a colourful healthy addition to a summertime menu. Bring 1 litre of water to boil with 1 tsp salt. Add the orzo pasta and cook for 7 minutes or as per pack instructions. Drain and keep aside. Bend the asparagus spears so they break at the optimum point, giving you the top portions to cook and the more fibrous part of the stem to discard. Chop the asparagus into 1” batons. Blanche the asparagus in a small pot of boiling water for 4-5 minutes and immerse in cold water to retain the green colour. Remove and dry out on a kitchen towel. While the pasta is cooking, peel the husk layers and the silk from the corn. On an open flame, grill the corn, rotating periodically to get a uniform char all over. You’ll hear popping sounds as the corn gets charred all over. You can also do this on a grill, if you have one fired already. Cool the grilled corn for around 5 minutes. Over a bowl, run a sharp knife shear to shuck the grilled corn kernels off the cob. Deseed and chop the red bell pepper in 1 cm dice. Heat 1 tsp olive oil in a pan and stir the chopped bell pepper on a high flame for 2-3 minutes. 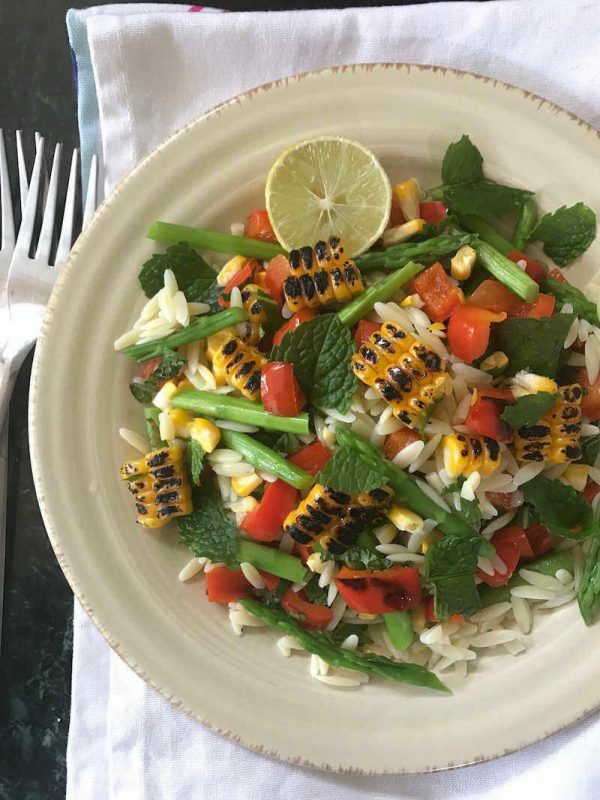 To assemble the grilled corn salad, toss the orzo pasta, grilled corn kernels, blanched asparagus, sautéed bell pepper, mint leaves in the extra virgin oil, seasoning with 1/2 tsp salt or as per your liking. Squeeze the lemon and combine to mix well. Serve chilled or at room temperature. If you can't find orzo pasta or couldn't be bothered to stock it, which is totally understandable, go ahead with any short pasta like macaroni or elbows or small sized fusilli. Asparagus has a frightfully short season in Bangalore, so you can either substitute it with tender green beans, cooking them similarly, or omit it. When in season, Namdhari's chain of stores stocks very good quality asparagus at very reasonable prices. What is your favourite way to use corn, apart from grilling and eating it as it is?Do share! 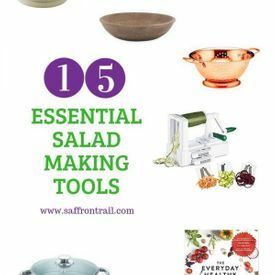 Lovely blog… feel like digging into the salad bowl rightaway. And, I have prepared sweet corn kosambari, halwa and also have stir fried shelled sweet corns in a hot Kadai in pudina paste. Sweet corn masala(like chole) and also as a part of sandwich fillings. I tries it and it works. Fantastic recipe. Thanks for sharing.